The Right Honourable Robert Taschereau, P.C., C.C. Robert Taschereau was born in Quebec City, Quebec, on September 10, 1896. He was the son of Louis-Alexandre Taschereau and Aline Dionne, and the grandson of Jean-Thomas Taschereau, who had been a judge on the Supreme Court of Canada. He studied at Laval University, earning a B.A. in 1916 and an LL.L. four years later. Called to the bar in 1920, he joined his father's law firm, Taschereau, Roy, Cannon, Parent & Casgrain, in Quebec City. He also taught criminal law part-time at Laval for 11 years. In keeping with family tradition, he entered politics and was elected to the Legislative Assembly of Quebec in 1930. He was a member of the Assembly until 1936. On February 9, 1940, he was appointed to the Supreme Court of Canada, filling the vacancy created by the death of his former law partner, Lawrence Cannon. 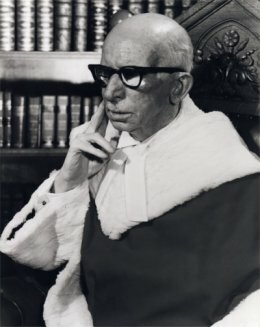 In 1946, along with his colleague on the Court, Justice Kellock, he co-chaired the Royal Commission on Spying Activities in Canada, which was set up as a result of the so-called "Gouzenko Affair." On April 22, 1963, he was appointed Chief Justice of Canada. He served on the Supreme Court for 27 years, retiring on September 1, 1967. Chief Justice Taschereau died on July 26, 1970, at the age of 73.